I'm sure many of you were like me when you heard that Jeff Smith, the creator of the hit indie comic book, Bone, was producing a Captain Marvel/Shazam! comic book for DC Comics. You were excited. I figured that since Smith did fantasy and magic so well in Bone - so well in fact that even the various trade and book collections of Bone have been bestsellers - that he'd produce, at least, an entertaining comic book. After one issue, I'm not disappointed, and I'm anxious for more. Shazam! The Monster Society of Evil #1 is a retelling and revision of the first Captain Marvel story from Whiz Comics #1. Billy Batson is a homeless boy who lives in an abandoned building, and sometimes an adult vagrant brutally beats Billy for what little money the boy has. After a series of surreal encounters, Billy meets The Wizard, and the mysterious aged man introduces Billy to the magic word, "Shazam!" With that magic word, lightning strikes Billy's body and it becomes the host for Captain Marvel, a tall strapping man of great power. In the original Captain Marvel stories, when Billy said "Shazam!" his body transformed into the adult Captain. Although I'm not at all versed in DC Comics' various incarnations of this character, I'm sure this isn't the first time that Captain Marvel and Billy have been portrayed as two separate and distinct individuals, with Billy acting as a host for the superhero. Although its no big deal to me, I prefer the idea that Billy becomes the Captain rather than being his host. Anyway, I like Smith's unpretentious and not flashy way of telling stories rich in magical power. 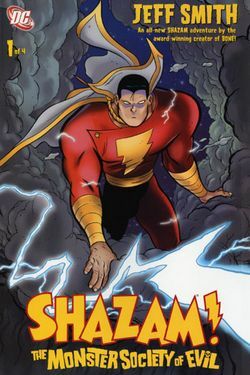 Shazam: TMSOE is an adventure comic book in which a poor boy - one of those children society tends to throw away or ignore until they shoot someone - gets to save the world and give back to society more than it ever gave to him. Smith's Billy Batson is a scrappy little survivor, and I'm curious to see where Smith takes him in terms of how much he's willing to sacrifice if he is to be a hero. I'm guessing that Smith is indeed going to test Batson. Meanwhile, in this first issue, Smith suggests that there is a lot more to Captain Marvel than we ever imagined. There's mystery in that mighty man, and he's not just another super-powered Superman clone (which is more or less what he's been with DC). Smith's art is stylistically the same as what he used for Bone, likely because there's no reason to radically change what he's been doing, especially since he's been doing it so well. This is his take on Captain Marvel, so why not stay true to himself? Colorist Steve Hamaker does a spectacular job coloring this book. He enhances the magic of Smith's work. I like superhero comic books that are fun to read. When they're filled with a sense of mystery and wonder, they are like little packets of magic. The best children's literature (and comics could be that) puts a magic spell on the reader that may sometimes stay with him or her even into adulthood. I'm betting Jeff Smith's Shazam! The Monster Society of Evil at least comes close to that. Shazam! The Monster Society of Evil #1 is not available directly from the publisher. Visit your local comic book shop for a copy. I also write movie reviews at http://www.negromancer.com.